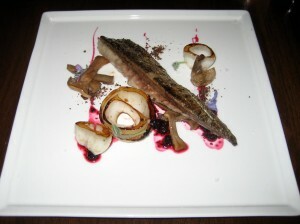 Norwegian mackerel, bluefoot mushroom, onion, juniper, huckleberry. This mackerel is full flavored that can best be described as earthy. This is an interesting, but enjoyable dish that combines the saltiness of the fish with the sweetness of the huckleberry. The white onions were almost completely raw and were very potent. Grilled whole soybeans, sea salt. 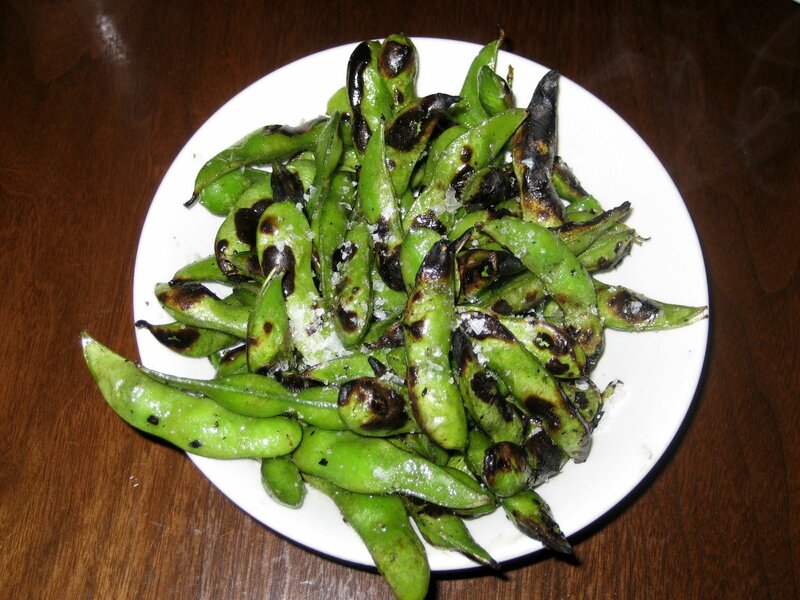 The food at Uchiko is anything but ordinary, and the edamame is the perfect example. The chefs took something so plain and simple, and turned it into a fabulously addictive snack. How did they do this? 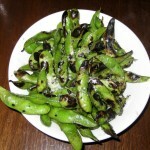 By grilling the edamame on an open fire instead of steaming them. This allows the shell to absorb the flavors from the grill. You must give it a try! Skyr yogurt, bitter greens, acacia honey. 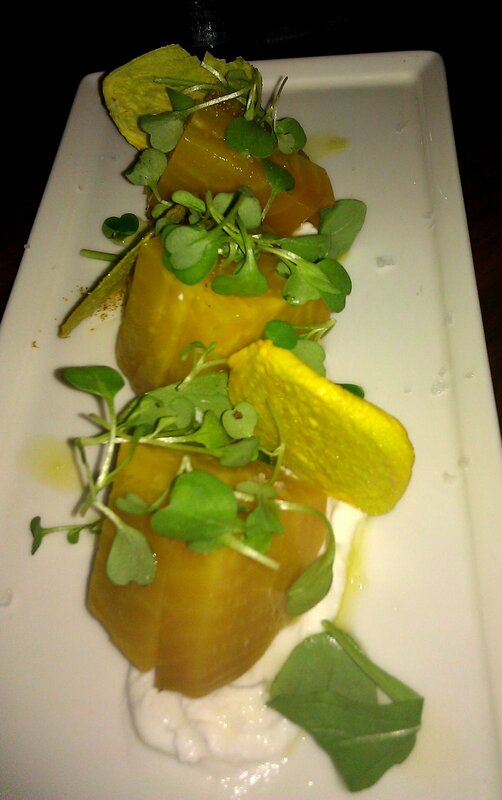 These beets were on the firm side, and the roasted flavor didn’t come though. They were also very sweet due to the honey and could have benefited from more bitter greens. The beets sat in Skyr yogurt, an innovative touch. Regardless of the mishaps, it was a unique take on beets. 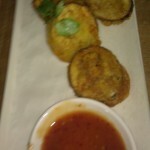 Japanese eggplant crisps, mitsuba, sweet chili sauce. These have a deliciously addictive texture and flavor. 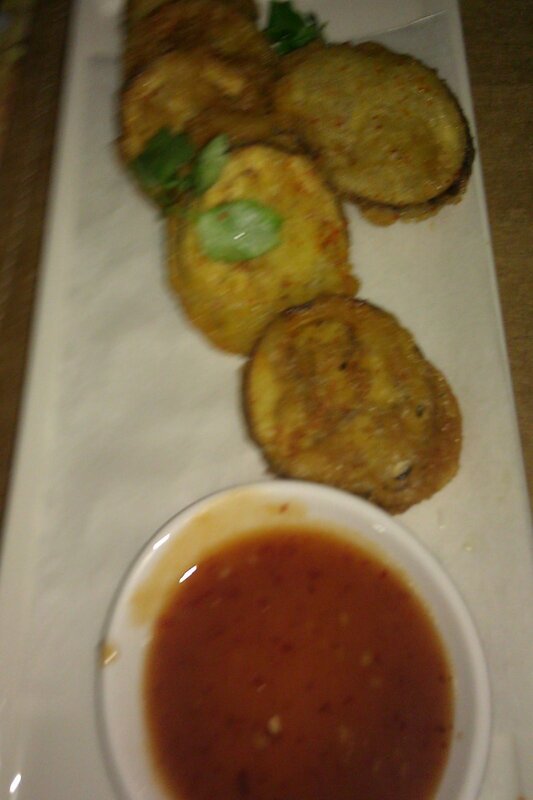 The eggplants are just the right amount crisp and the chili sauce and mitsuba (Japanese parsley) are a thoughtful addition. Although all the portions are on the small side, this one seemed even smaller! Cilantro stems, grape tomatoes, myoga, Thai chili vinegar. 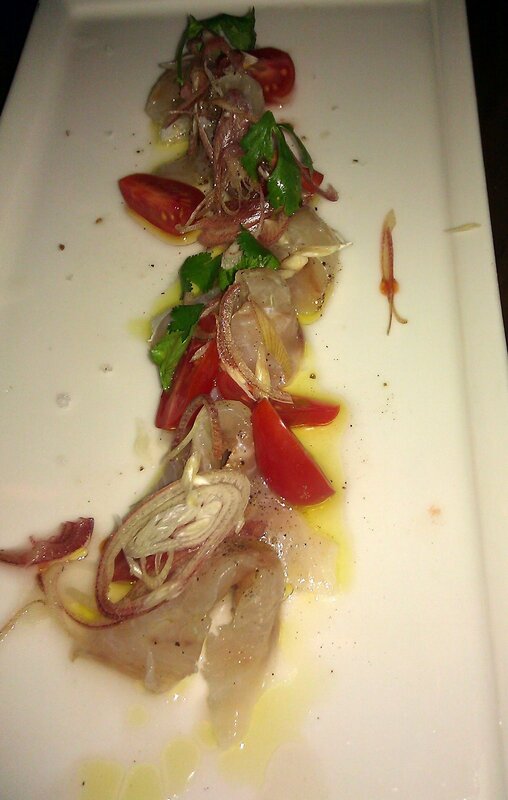 This thinly sliced carpaccio is delightful, and the cilantro and myoga (ginger) are a fun addition. The vinegar provides just the right amount of acidity to balance the sweetness of the tomatoes. 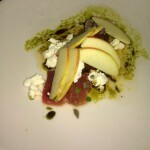 Fuji apple, pumpkin seed oil, black pepper. Your mouth will rejoice at all the different aspects of it. 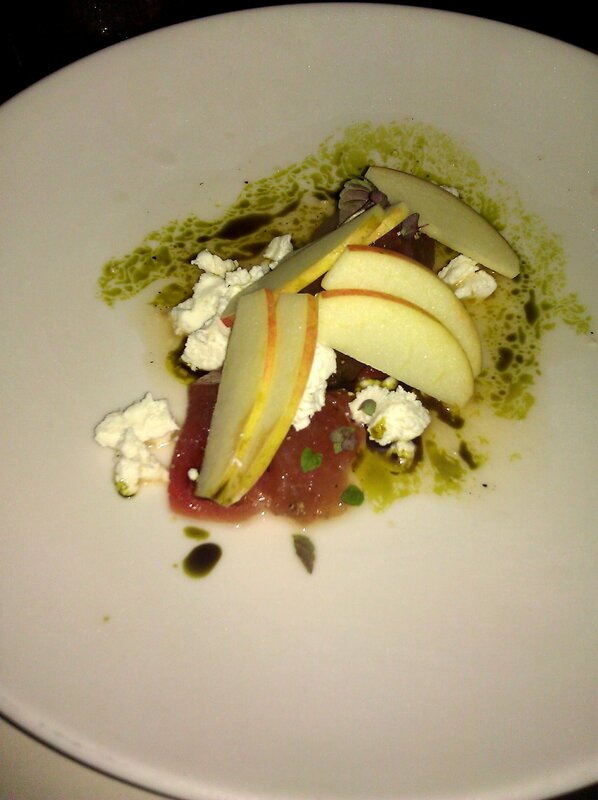 The tuna sashimi was smooth and delicious, the apple crisps added a nice little crunch, the goat cheese provided a creamy nuttiness, and the black pepper and pumpkin seed oil complemented the sashimi nicely. This is a very well executed dish. 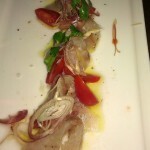 Yellowtail sashimi, sliced Thai chili, orange supremes. Another winner! The flavor seems to hit every corner of your tongue. The yellowtail is fresh and the orange bits effectively offset the heat from the chili. This is a real treat for your taste-buds. We haven’t really mentioned presentation too much – but every dish is artfully displayed. 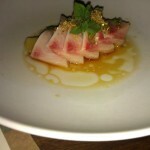 Japanese yellowtail, avocado, yuzu kosho, grilled negi, cilantro. 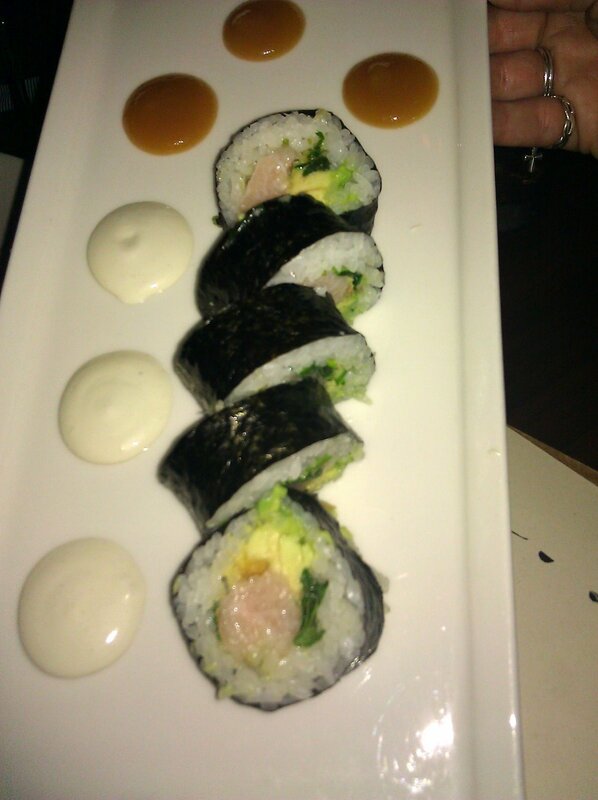 This roll was not as unique as some of the other small plates. Yuzu is a citrus fruit, and yuzu kosho is a spicy Japanese sauce made from yuzu zest, chili peppers, and salt. The grilled negi (onion), avocado, and hints of cilantro enhanced the already delicious yellowtail. Although this dish had lots of elements, it tasted a little one-dimensional. 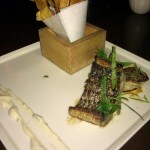 Grilled Mediterranean sea bass, satsumaimo, tarragon. 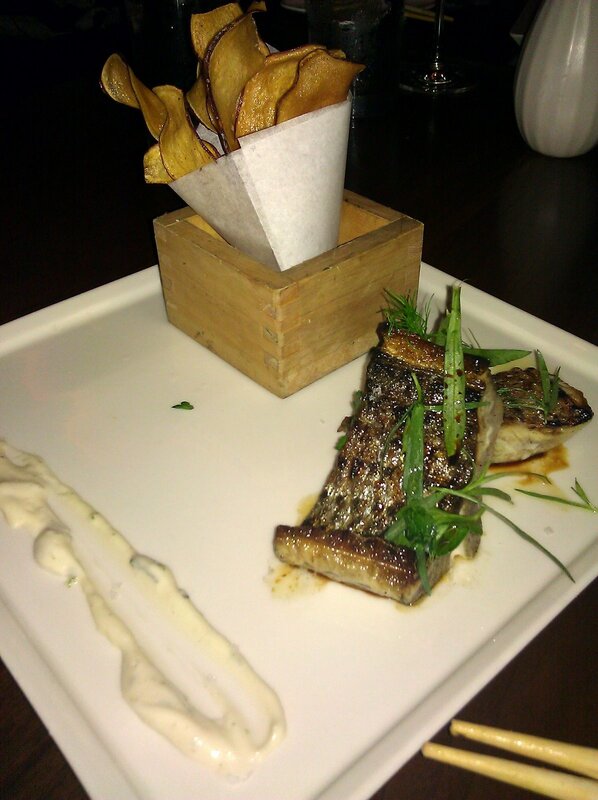 The sea bass was cooked perfectly on the inside, but the skin was tough and chewy. The satsumaino (Japanese yam) and tarragon were very nice choices. The flavors and textures played off each other nicely. This is finger-lickin good. Grilled wagyu steak, yuzu kosho, toasted rice, cilantro. This was pretty fantastic! 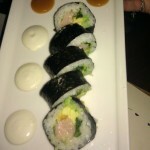 Similar to previous dishes, there is a great melding of flavors. The steak is a little tough, but very tasty. The toasted rice adds a nice crunch, and the cilantro adds some freshness. 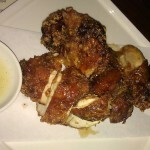 Fried half chicken, sansho pepper, seasoned pickle. This is one of the larger portioned dishes that we sampled. The chicken was slightly spicy, but when dipped into the sauce it balanced the heat well. Sansho is a tangy, earthy seasoning that is often used to flavor meats. 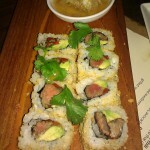 An overall solid dish, but there are far too many frontrunners to order this again! 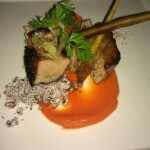 Grilled kurobuta pork belly, carrot, pecan soil. One of our favorites. The pork belly is succulent, juicy, tender, and just the right amount fatty to where the pork almost melts in your mouth. 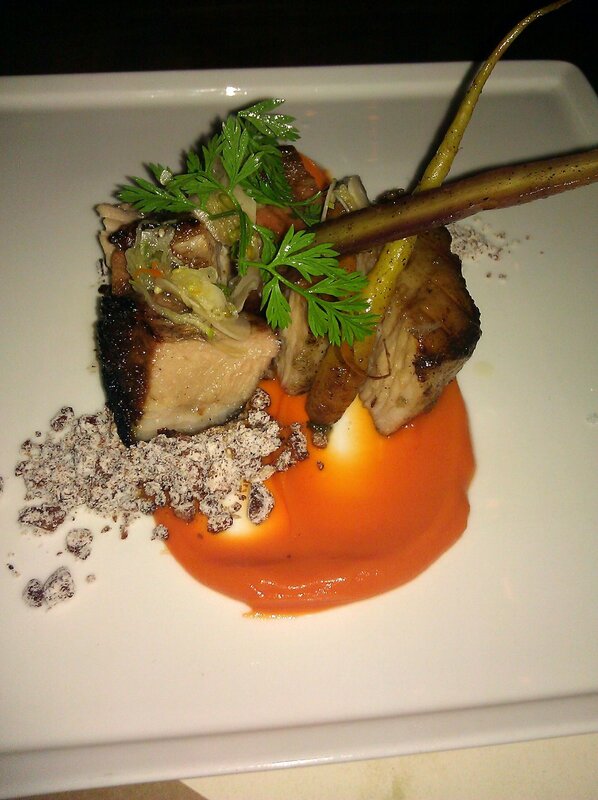 The soft carrots and miniscule pecan pieces complement the pork beautifully. We rarely give perfect ratings, and cannot think of anything we’d change about this dish. Except to double the size! 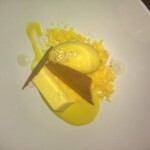 Polenta custard, caramel salt, lemon. 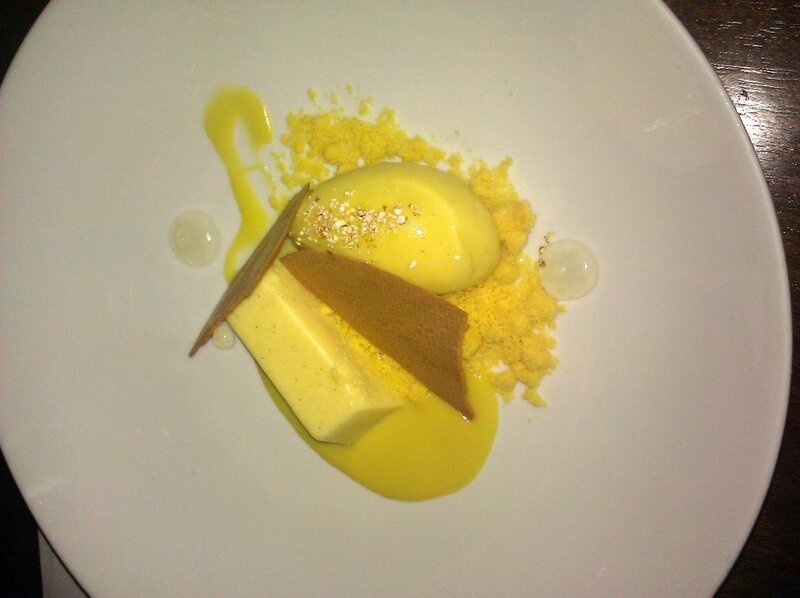 Although we appreciated how distinctive this innovative dessert was, it’s not something we’ll be craving later. It is refreshingly light and has a subtle sweetness to it. We couldn’t taste too much caramel flavor, but the corn flavor came through easily. It was a fun dessert to try, but just not our cup of tea. We ate dessert too soon after finishing our last small plate, so we would give this another try next time. 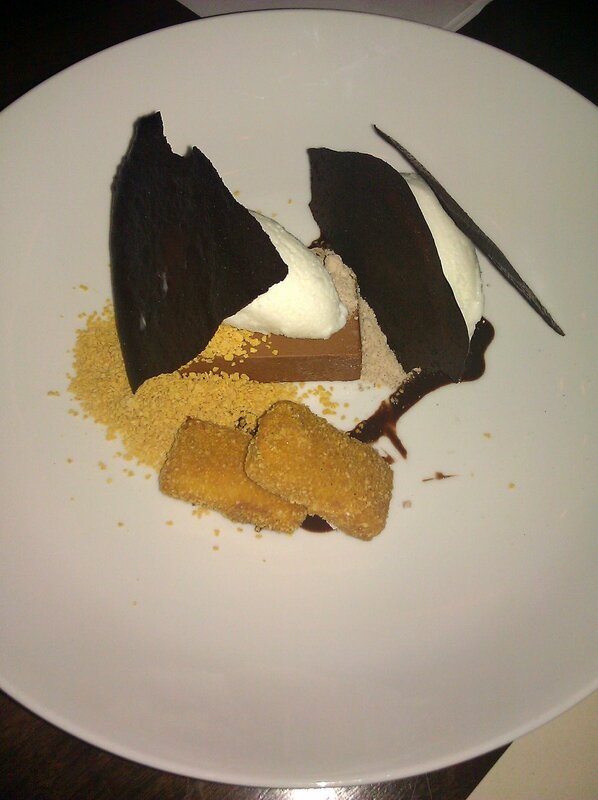 Chocolate milk, toasted milk, iced milk sherbert. 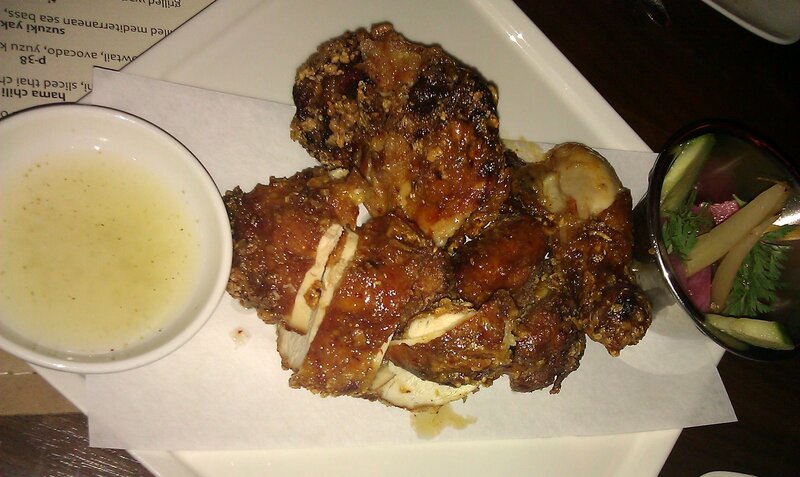 We’ve heard so much about the fried milk at Uchi and looked forward to trying it. Although we’re going against the grain, we just didn’t like it that much! It is creamy condensed milk with a crunchy fried exterior, milk sherbet, chocolate milk mousse and toasted milk crumbles. The exterior was too thick, and when you bite it the lukewarm milk inside gushes out. 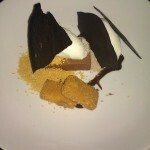 It is a very interesting dessert – and an original concept. We’re just not a fan of the final result! A large group of us dined on a Wednesday evening in their private room and listened to a pharmaceutical presentation. The hostess was sweet and pointed us in the right direction. The staff members were nice enough, but lacking a little in hospitality. We think it was because they were anxious and trying to serve everyone quickly and quietly. Our friends were dining near the bar, and they said the service was great. In our room, the door opened and closed too often, and all the outside noise came in. One time, a plate of silverware was dropped on us – which was of course distracting and a little painful. The waitress did apologize. Our water was refilled without us asking, and plates were removed and brought out in a timely manner. Overall, the service was pretty good, but probably better if you dine as a small group. 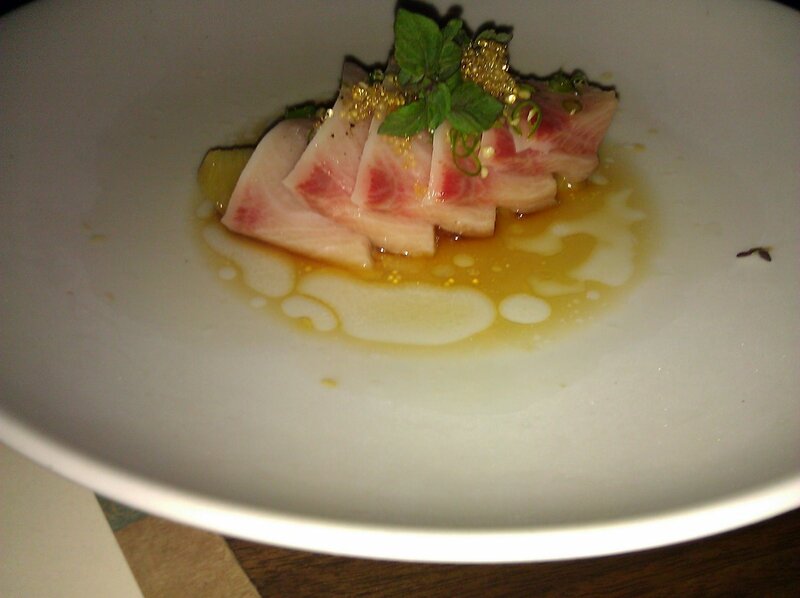 Uchiko is Uchi’s sister restaurant and is located in central Austin. Complimentary valet is available, but sometimes you can park in the adjacent lot. The décor is classy, with a dimly lit interior and high ceilings. There is a main dining area, a bar area with tables and booths, and a private room available. The noise level is pretty high, but we were still able to hear each other. 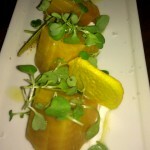 We truly enjoyed our experience at Uchiko. When chefs experiment and push the envelope, they’re bound to have a few missteps. For the most part, it was a wonderfully unique flavor explosion. Often times, one of the elements in a dish will highlight and showcase the flavors of another item, and it becomes a savory experience for your palate. 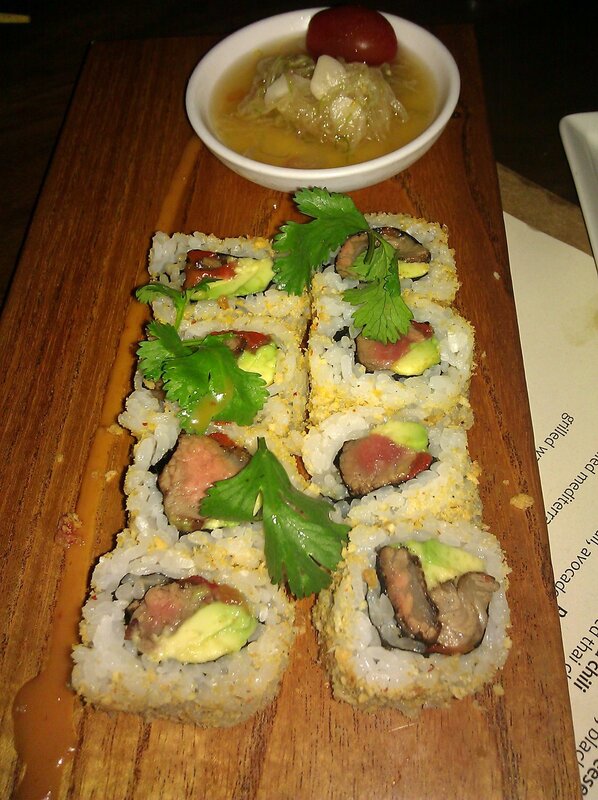 Although Uchiko will put a considerable dent in your wallet, the prices reflect their culinary creativity. It is better for couples and groups, and would be a great choice for special occasion dining.